OK, I have just one question – how in the world did I live to be 45 years old and without ever eating noodles Romanoff before now? Harald said he remembered it from his youth, but it was totally new to me. Have you ever had one of those experiences where something smells so good cooking, and it’s in front of you for the first time and you take that first bite and your immediate reaction is “Nothing should taste THAT good!” I’ve had that reaction quite a few times, but it’s been a while. Probably the last time was the first time Harald made his now-famous coconut cake. Well, earlier today we were sitting in the basement and he was looking through Beatrice Ojakangas’s cookbook entitled “The Best Casserole Cookbook Ever” – which, I might add, is not hyperbole. I’ve made quite a few recipes from this book, and I’ve thoroughly enjoyed every one of them. But I digress. 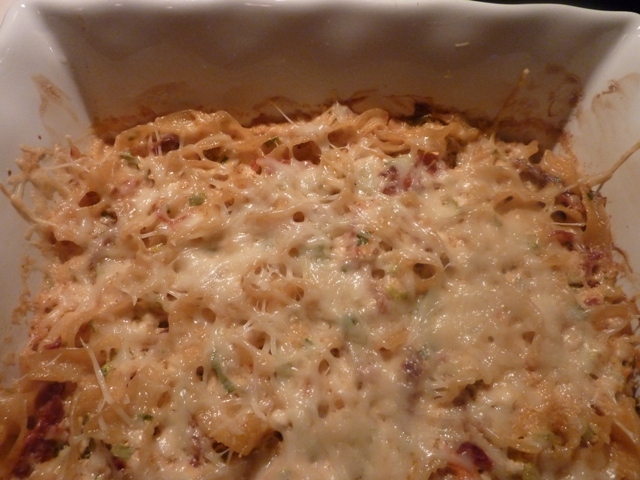 Anyway, Harald wanted to make another receipe, then kept looking and came across this noodles Romanoff dish, which she doesn’t call by that title because she’s made one addition. Julienne sliced sun-dried tomatoes are added to the pasta while it is cooking, thereby rehydrating them. But the rest of the magic was in the baking. Now, if you aren’t familiar with this dish, it uses large amounts of cottage cheese, sour cream, and a few other unexepcted ingredients, like Worcestshire sauce and hot sauce, but the end result is far greater than the sum of it’s parts. I just can’t figure out how this dish escaped my attention for this long, given how often I pore over cookbooks, and how much I love anything even remotely Russian or Eastern European in flavor. OK, ok, yes I know, it’s an American invention, but still … creamy, tangy, rich, cheesy, supple …. completely soul satisfying food. Dear lord, I had to put the leftovers away immediately. I knew if I left that dish on the counter, I’d be back in the kitchen every half hour for the rest of the night eating another bite. Oh, yeah, the rest of the dinner was good too. Here’s the cookbook the recipe came from (and I’m dying to try the Macaroni and Cheese with Lobster casserole!). If you love casseroles, you’ll love this book.